Procacci is located in the heart of Florence, on the famous Via de' Tornabuoni, a street along which one finds some of the most prominent mansions of the city. Founded in 1885, the Procacci Company is still today considered to be one of the most historic local delicatessens in the city, with its historic legacy in artistry and handcraftsmanship. When it opened, this place won vast recognition in a very short time amongst the locals with its truffle-based gastronomic specialties. 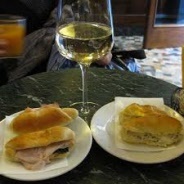 The 'truffled' sandwiches became an institutionin Florence, and is still very alive today. In 1925,Procacci was given the royal coat of arms by King Victor Emanuel III with the certificate of the Royal House. The unmistakable aroma of truffles permeates the main room, remaining unaltered over time. With its shelves made of walnut and its green Liberty-style marble counters, this room has the sober, yet fresh, atmosphere of Florence at the beginning of the 1900's which still makes it a renowned meeting place for Florentines. In order to carry on this tradition, Procacci Vienna was recently opened, to bring to life even abroad, amongst other things, the gastronomic specialties of Tuscany.